Next → Next post: Service Kilometres Per Capita – are public transport services keeping up with population growth? Geez, I would have been screaming and yelling four-letter words at the woman by then. Sounds like you kept your cool. Well done. One consolation, at least you were in Bentleigh not Barcelona. Just before I get the 703 bus tonight, I’ll pop in and say hi to Jason. I would suspect there is a lot more on-line back to base checking and status reporting going on during the transaction than when ATMs were first introduced. For example, I’ve noticed that in the last couple of months there is a new, lengthy, delay between putting my card into an ANZ ATM and getting the passcode page. I would suspect that the ATM is now doing some additional on-line back to base verification of the inserted card before proceeding to ask for the passcode. I remember reading years ago about a situation where ATMs were on a bank’s LAN; the ATMs were running some old unpatched Windows, and ended up infecting all the other computers on the network. Now there are many things wrong there, but I’m sure running a desktop OS is probably one of them. I’ve never had that sort of trouble with an ATM even after using them since the mid 80’s. One time many years ago after taking several hundred dollars out of an ATM in Massachussetts I counted the money and it was short. Luckily the bank was open and an employee opened the ATM and the extra bill (note) was stuck in the dispensing chute. I suppose over the years things naturally get more complicated and additional security features slow things down. Bahahahhaha, that snippet from Wiki is gold!!! You know what I find annoying with ATMs these days? The “would you like to save this is your favourite transaction” question. go away. As an ANZ ATM user, I agree with the earlier Andrew. ANZ machines are much slower now. Some are part touch screen, some not. Very confusing. Cover the keypad with your hand, you are told, while you use one hand to push buttons and the other is holding your wallet. An ATM swallowed my card years ago, but I can’t recall how it was resolved. I have accidentally left money in the ATM a couple of times. Lost a few hundred dollars. Very annoying. I think it happened for these reasons: 1) I was in a hurry, stressed and not thinking straight. 2) The ATMs used to give cash first and then card, now they give card first and then cash so once i got my card, I ran off. The solution would be to go back to giving cash first and then card. Also, have an audio voice saying “please take your cash, please take your cash” as soon as you specify the amount to be withdrawn. Having been bitten twice, I now use the supermarket to withdraw cash as it doesn’t require me to insert my card and also gives spoken audio telling me to take my cash. All myki devices also use a Microsoft operating system. Not sure why most ATM’s have to hold your card. HSBC machines are sort of “insert and pull out” swipe types. I prefer these ones. a) Windows XP, is slower than OS/2 was at initialising the peripherals, eg. the card reader after returning a card and being ready for the next card/transaction. Though that doesn’t impact the speed of a transaction as much as the speed between transactions, you are waiting for a couple of seconds before the machine can accept your card. b) EMV chip card processing, the new delays are the ATM reading the chip and retrieving processing rules associated, same issue at POS terminals. EMV is the elephant in the room. @Jacob – I imagine the order was reversed because from a bank’s perspective, they’d rather you lose a couple of hundred in cash, than your bankcard, which they need to replace and/or deal with the consequences of fraudulent use. @jacob I’ve always believed the order of return – card first, then money – is deliberate. If you forget your money, your loss is fixed and can’t lose any more money. If you forget your card, your loss is potentially greater – at least to your account balance or daily limit. The ANZ, for example, states that “the account holder is liable for losses arising from unauthorised transactions that occur because a user contributed to the losses by leaving a card in an ANZ ATM,” although it is not clear how this clause relates to the surrounding clauses limiting liability. If the cash is delivered first, there is quite a high risk that people in a hurry will grab the cash and, having ‘completed’ the transaction, forget the card. It is almost impossible to forget the card, however, if the ATM requires it to be removed before the cash is delivered. Good psychology. Incidentally, I time a withdrawal at an ANZ ATM yesterday – 38 seconds, and this included entering the amount. Shorter than I expected. I agree with @Julian and @andrew. So far, I’ve never left either card or money behind in the ATM, but it’s the money I’m much more focused on, so it makes sense to me that the card should come out first. 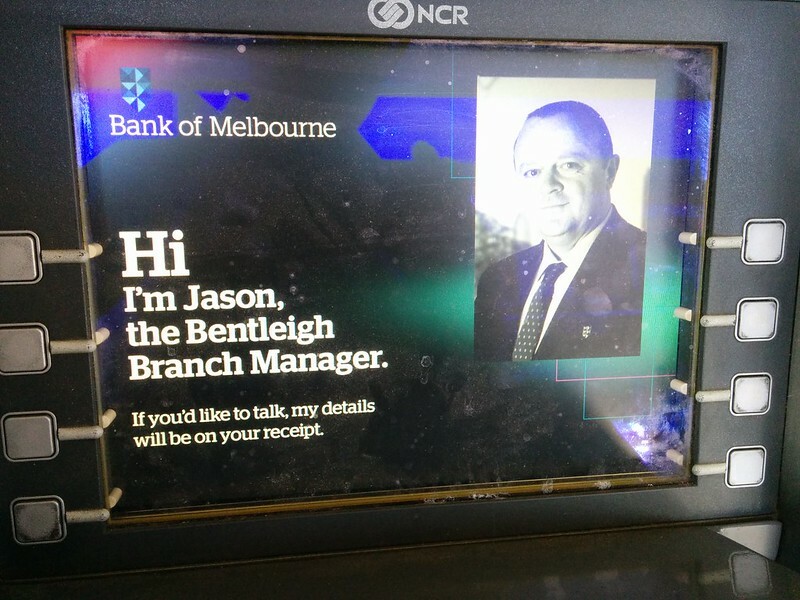 There’s another ATM design feature that I didn’t know existed until a colleague told me a few years ago. She had stopped to make a withdrawal from an ATM on the way to work, but it was only after arriving at work that she realised she had failed to collect the cash. She rang the bank in some distress, because it was several hundred dollars. They investigated, and told her everything was fine; when she failed to take the cash within a certain number of seconds, the machine had swallowed it again. So she wasn’t out of pocket at all. This feature wouldn’t apply to every machine – I’ve seen some ATMs that drop the notes into a tray, rather than just poke them out of a slot. I don’t think they’d be equipped to swallow the notes again. And of course the whole thing depends on there being no one standing behind you, or walking past just after you finish the transaction. An honest person would alert you to the fact that you’ve left cash behind, so the feature would be redundant, and a dishonest person would just pocket the money. But it’s a useful feature, and one that neither I nor the people in my office had ever heard of. I wonder how widely known it is. You get cash from the supermarket ? Hah ! I’ve never left cash behind in the ATM, at the supermarket I have tried extra-cash-out twice, and then forgotten to take the cash twice. I am used to collecting coins for change, the notes come out of a slot at ankle level, very quietly. The ATM’s are much slower than they used to be, I assumed it was because slow-witted people take several minutes to read the instruction to hide their pin number.